← The Phantom Commandment Challenge — Church Without A 1-Man Sermon? Is Physical Reality A Holographic Phantom — A Mere Illusion? 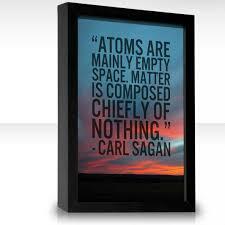 It is a matter of fact that matter (everything in the physical universe) is a mere illusion. 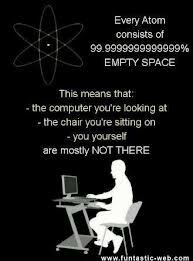 An atom is 99.9999% empty space. In reality an atom, the building block of matter, is nothing but a force field — energy rushing around empty space at the speed of light. Think about it. The whole world is in reality, so small you can’t even see it. The rest is mere energy creating a grand phantom that seems real to us all. Concerning reality, we humans understand very little. There is a deeper degree of reality that science is not privy to. It is a more complex dimension beyond our intellect, accessible only to our inner being, our heart, our spirit. This dimension has been called intuition, faith, mysticism, spirituality, love, and God. “No scientist has ever seen an electron. No scientist soberly thinks that anyone ever could. In fact, ‘electron’ is simply the name for a set of things that happen under certain circumstances. Yet nothing is more ‘real’ to a scientist than an electron. Chairs and tables and rocks — these are in fact not very ‘real’ to a scientist, if he is thinking deeply. A table, viewed with the precise tools of the atomic physicist, is a shadowy, swirling set of electric charges, these electric charges themselves being very vague and elusive. So viewed, the table completely loses its large-scale illusion of solidity. A scientist is just the one who should not say that God is ‘unreal.’ For the scientist knows that the everyday reality of the table and the rock is an illusion, and that reality is in fact a very subtle, evasive, and somewhat abstract business.” –Warren Weaver, Ph.D. This entry was posted in atom empty space, Big Bang Theory, Carl Sagan, electrons, Jesus, materiality, nature of reality, physics, Quantum physics, quotation, speed of light, truth, what is real and tagged atom empty space, atomic theory, big bang, hologram, holographic theory, quotes, reality, science, spirituality. Bookmark the permalink. 4 Responses to Is Physical Reality A Holographic Phantom — A Mere Illusion? This is a very subtle form of deception. You have used the modern discoveries about atomic structure to support what is mere speculation. The last statement seals this off from all probing minds– no one can argue its beyond intellect. We are forced to take your word for it. Thanks for your comment, magnocrat. Many people, including atheists and agnostics, have stated that faith is beyond intellect (or science). That statement is not deception, but a rather obvious principle that is widely agreed upon by people of diverse opinions. Anything beyond science or intellect is in the realm of the untouchable. Thats fine but why use science to prove the existence of such a realm? Its like saying this is beyond science and intellect and now I will use science and intellect to prove it exists! I believe you are using the concrete facts of science because you know they are accepted by many, to prove the unprovable.